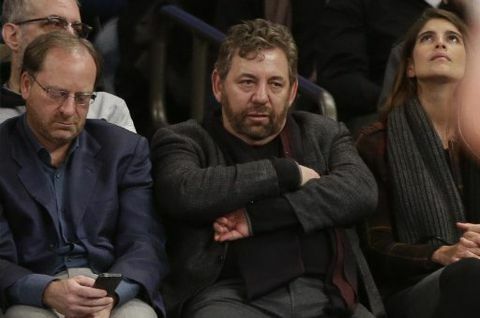 After a recent game, things got pretty testy when a fan told owner James Dolan to sell the team. The fan then claimed that he was just offering an opinion, to which Dolan said, "No, it's not an opinion, and, you know what?" "Sell the team!" the fan shouted toward Dolan as the basketball executive walked away from the court, in video posted on TMZ Sports. Meanwhile, the Knicks are officially the worst team by record in all of the National Basketball Association, which is not unfamiliar territory for the franchise during Dolan's tenure as owner, where they've endured historic losses while going through seven team presidents and twelve head coaches. Sacramento Kings guard Yogi Ferrell (3) drives against New York Knicks guard Emmanuel Mudiay (1) during the second quarter of the game at Madison Square Garden on Saturday. "Our policy is and will continue to be that if you are disrespectful to anyone in our venues, we will ask you not to return." They had no such luck, and a few years later, the team's management can only cross its fingers that the latest owner-inflicted lowlight doesn't come back to haunt the Knicks when free agency begins. The EU has said it is now up to MPs to decide the next steps for Brexit and it remains "committed" to agreeing a deal. What's the likelihood Parliament would vote for a "no-deal Brexit"? Downing Street has denied those claims. This looked to be the end of the discussion for Dolan, who told the man, "No, it's not an opinion". Apparently, freedom of speech isn't allowed inside Madison Square Garden. The 55-year-old Oakley played for the Knicks from 1988 to 1998, helping them reach the NBA Finals. There are no confirmed reports on whether or not the fan is banned for life from attending Knicks games. Oakley has a rocky history with Dolan. "Why would I want to do it with someone who had me dragged out of the Garden for no reason", Oakley said Monday. And that's understandable, as the Knicks are the worst team in the National Basketball Association, with an abysmal 13-53 record.